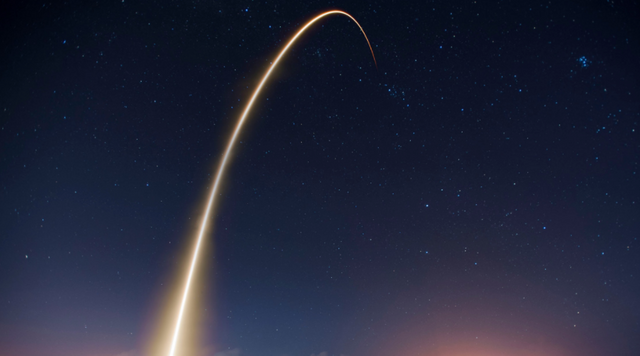 These crypto coins are going TO THE MOON - What do you think? Here are the cryptos I have my eyes on. Ripple has gone to the moon over the past two days! It opened at $0.25 on December 12th and moved to a high of $0.866 around midday on Thursday, December 14th. XRP has risen roughly 91.9% in the space of 24 hours and upwards of 300% from the weekly low of $0.2222 it reached on December 8. Year to date it has increased more than 11,000%. As Charles Bovaird of Forbes notes, the rise in price as of late is probably due to investors seeking to diversify their portfolios. Several market observers asserted that Ripple's XRP tokens have been pushing higher as investors seek to diversify their portfolios with alternative protocol assets or "altcoins." Jeff Koyen, CEO of 360 Blockchain USA, a subsidiary of 360 BlockChain, agreed with this point of view. As mainstream investors rush into crypto, they're looking for bitcoin alternatives — either as a hedge or because bitcoin appears overbought. Litecoin lit up first, then it was Ethereum. These shoppers are working their way down the top-10, looking for safe, familiar names. Ripple fits the bill perfectly. Yazan Barghuthi, project lead at Jibrel Network, offered similar input, stating that the major altcoins have been positioning themselves to draw investment when Bitcoin suffers an inevitable correction. If this assessment is true, expect XRP to see some nice gains over the couple months as the crypto slowly make their way into the mainstream finance and catch more peoples attention by the day. On a side note, the market cap for all cryp's is now sitting at $517,757,829,873. Verge has literally ... Shot to the moon! While it's price is still very low (still could be a great opportunity to buy if you ask me), Verge has gone up well over 100% in the past 48 hours. Total anonymity and fat processing you say? Yes, that is exactly what has made me attracted to this coin. If you do not know much about Verge, read it's black paper here - https://vergecurrency.com/assets/Verge-Anonymity-Centric-CryptoCurrency.pdf]. While it has been down most of the day today, Ethereum has seen a YUGE run the past three days. 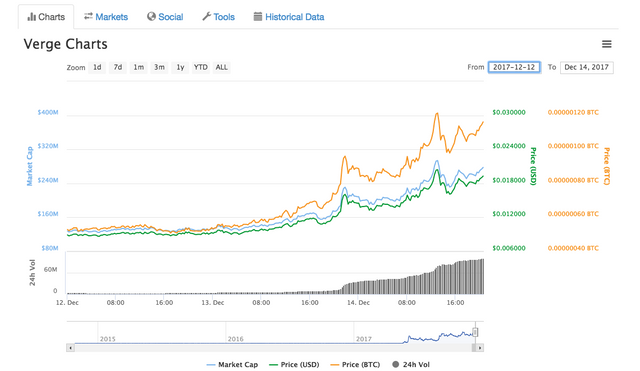 Eth hit an all-time high of $750 on Thursday, coming up from $440 dollars on December 11th. What is causing this uptick? Here is what Cryptocoinsnews.com has to say. Earlier this month, billionaire investor Mike Novogratz predicted the price of Ether to increase by three-fold throughout 2018. In terms of developer activity and transaction volume, Ethereum remains as the only public blockchain network which can compete against bitcoin. In fact, as of current, the Ethereum blockchain network processes more transactions than all of the cryptocurrencies in the market including bitcoin combined at 820,000 transactions per day. Decentralized applications such as CryptoKitties and EtherDelta have also demonstrated the potential of Ethereum as the base protocol for decentralized exchanges and digital asset trading platforms, which is an application that is useful beyond finance. Already, CryptoKitties has processed $15 million worth of digital kittens within the past two months and other dapps like EtherDelta have also been processing more than 80,000 transactions on a daily basis. In my opinion, this is just the beginning of the leg up in Ether. I expect it to be the next coin to hit the CBOE or at least get some sort of traditional, old money financial acceptance inside the United States. Where do you see these crypto's heading? What are your thoughts on the direction of the overall market? I'd love to hear your thoughts in the comments. Got to look into Verge. Do you have thoughts about Ether's competition NXT and Ardor?